Hello again, stamping friend! As I’m sure you’ve noticed, I’ve been on a ‘scenery’ kick with my cards this week! With the exception of yesterday’s Paper Craft Crew challenge, that is. I created these cards last weekend, when we had some beautiful sunshine, and I was loving the outdoors! While the last 2 cards have been more about mountains, today’s card is a view of the water. This time, I used the Waterfront stamp set. Unlike my recent cards, this one is done without a lot of colour. Have a look, and let me know what you think. I’ve seen a lot of other demonstrators do these types of scenes in muted colours, so I thought I’d try my hand! On a 3 3/4″ x 5″ panel of Whisper White cardstock, repeatedly stamp the mountain image. Use Memento Black ink for the foreground, and Basic Gray ink for the background mountains. After establishing your ground line, stamp the water, first in Soft Sky ink, then add the shading in Marina Mist ink. Next, add the trees to your mountains, stamping in Memento Black ink. Without adding more ink, stamp the tree reflections into the water. For the sky, use a combination of the water stamps to create a ‘cloudy’ look by stamping in both Soft Sky and Smoky Slate ink. Stamp the birds, from the High Tide stamp set, in Basic Gray ink. The stamped image panel is layered onto a 4″ x 5 1/4″ panel of Soft Sky cardstock. Next wrap a length of the 3/8″ Shimmer Ribbon in Pool Party around the bottom, then tie a knot in the middle. Now layer these panels onto a card base of Marina Mist cardstock, with Stampin’ Dimensionals. The Waterfront stamp set is so easy to create with; being a photopolymer set, there’s no issues with lining up the images to stamp. I highly recommend this stamp set for anyone who likes to create a scene – but not the middle of the store, tantrum kinda scene! Click on the product images below to shop in my online store, 24/7. Next Next post: Welcome, Baby! This is stunning! It looks so peaceful and calm. So glad you like this card, Susan 🙂 I like to think those gray clouds are leaving – not coming! Deb this is wonderful! I love your mix of colors with black. Thanks for such a nice comment, Jackie! 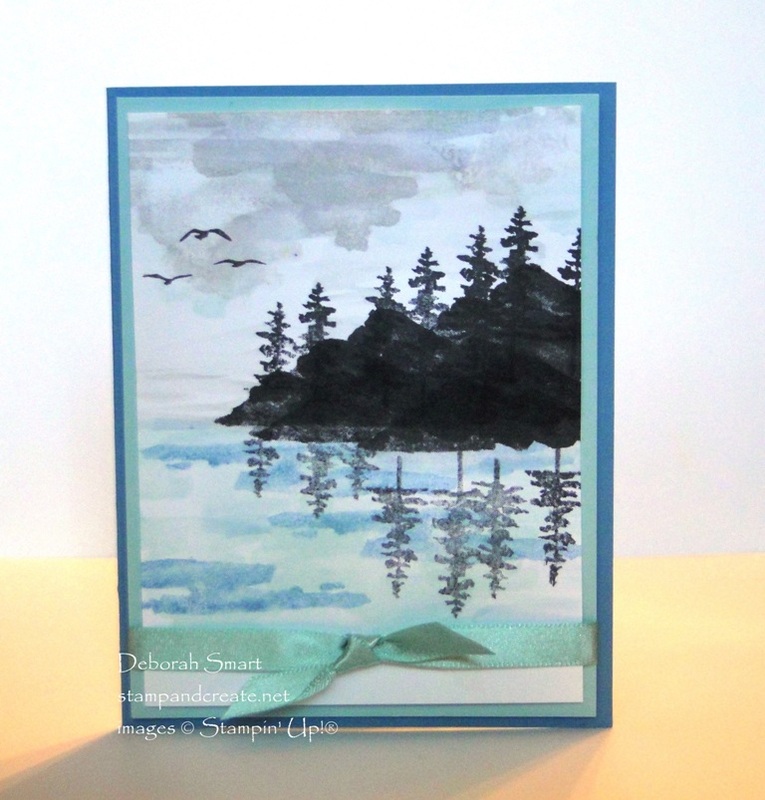 So glad you like this Waterfront card. Thanks for visiting!